Home / Blog / GO Homes’ Guide to Going Rural. Alright, you already know that it’s beautiful out there – but in all honesty, it’s probably worth mentioning again, so here goes: “boyyyyy, is it pretty”. However, there are a raft of reasons to make the change that go well beyond aesthetics. You can find yourself lots that are big! You’ll have more than enough room for all those projects you’ve been dreaming about. Vegetable patches. Chicken coops. Separate art studio. Whatever you want! Bigger lots and fewer neighbours mean you don’t have to worry about nosy neighbours peering over the fence and seeing you in your unmentionables. You can hang out your washing while letting it all hang out! Funnily enough, because there’s so many houses, people and cars, people feel more crowded outdoors than they do indoors. No wonder it’s so difficult to get your kids to play outside. However, in the country there’s so much to do and see, you’ll have a harder time keeping them inside. Seriously, country towns are great places to live. There’s low crime rates, friendly people and a real sense of community that you just don’t get in the city. Research has shown that living in rural communities gives your immune system a boost. Not to mention there are plenty of places to get out explore – which is great for the mind, body and soul. GO Homes has some great designs that are perfect for rural lots. 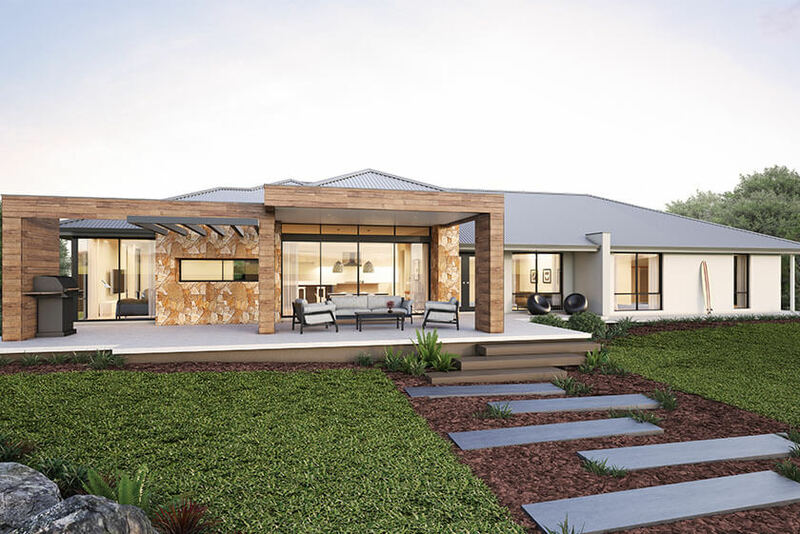 With four huge bedrooms two bathrooms and a massive open plan living space, and multiple outdoor areas, this house isn’t just big: it’s country big. You can check it out here. This list is going to be a whole lot shorter. Mainly because the negatives to moving the country can simply be summarised as “it’s not the city.” And you already know that – in fact, it could be why you’re considering moving there. When you’re living in the country, it can be a bit of a drive to get to your local shops, restaurants, cinema or hospital (however, on the plus side, there’s not as many people, so you’ll rarely find yourself waiting for a table or a doctor). And let’s face it, WA’s country roads are beautiful, so when you need to head into the city, it will be a nice, relaxing drive. Because there’s not as many businesses, there’s not as many jobs. On the other hand, that means if you’re starting up a shop or service, there won’t be as much competition. Rural areas are a great place to get to know your community and people love to support local business and services. Some people get a bit overwhelmed by how much work goes into keeping a big property looking great. Four bedrooms and a massive outdoor area are great – but it will take more time to keep it looking great. But if keeping your yard and garden pristine is your hobby, then a rural block could be the perfect fit. So are you going to make the tree change? We hope this has helped you make a choice, but in all honesty you probably already know if moving to the country’s the right move for you. Whether you head to the city, the suburbs or the country, we GO Homes has the perfect house for you. Check them out here. Next article 6 ways to go green - save a fortune and the environment.